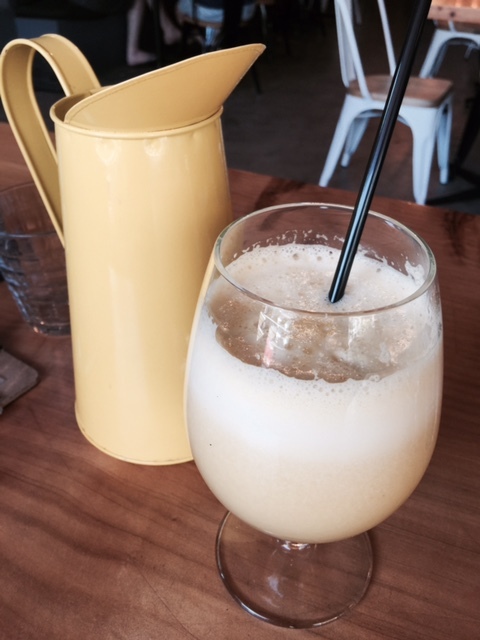 This is my 377th article for Weekend Notes and it's the first time I have ever said from the get go that this is a MUST Visit café. Now And Not Yet is only new but it exudes heart, soul and energy. I saw two of the waiters dancing… and I wanted to join in! They looked like they had experienced a burst of sunshine often felt when first meeting like-minded people that leave you wondering if you were destined to have found them at exactly the right time. Now And Not Yet is a not for profit social enterprise. It is run by a group of enthusiastic people dedicated to giving back to the community. 100% of the profits go to community projects. The name Now And Not Yet has a special meaning but it's not simple to explain so you'll have to ask Derek. Derek had the vision of this idea, although he attributes the success of the cafe to the community's appreciation of a great space trying to make community a better place. He is a father of four children, has a history of health issues and an ordained pastor with a wealth life experiences. For a man who claims to have no direct industry experience in the restaurant business, Derek's passion and conviction has remarkably resulted in unique way to do community service. Derek is a mild mannered young bloke with eyes that look into your soul. He had a vision about setting up a café and said that he finally gave into God's calling and let him work his miracles. But do not fear, a visit to Now And Not Yet Café will not lead to bible bashing; there is no talk of religion or church. If you read the information about the establishment of the café you might be intrigued like me. We had a chat to Derek after reading about the café and I was in awe of his beliefs and the impact on his behavior. They are keen for more volunteers so chase him up yourself. They would welcome your contributions and participation so feel free to him about how you can be involved. I note that the service was friendly and efficient and couldn't pick the volunteers from the regular staff. Believe it or not Derek thinks he is the lucky one. He asked me: 'What job do you wake up each meaning and you know God has something great in stall for you?' He had me there! If you go to Now and not yet you'll meet a bunch of genuine people understand the joy of giving and who are out to make a difference. The whole family is involved: Derek's mum, dad and his 12 year old helps wash dishes on Saturday mornings. As I am reviewing a café I should say a word or two about the food. The mixed juice was the best I have ever tasted and truly heaven sent. I even asked for the recipe. It was two oranges, four pieces of pineapple, one green apple and three pieces of mint. It was like a non-alcoholic pina colada with a refreshing hint of mint. I bought the ingredients so I can test it out for myself. After one sip I'd already decided that I would revisit this place just for the juice… but that was until I tried the smashed avocado. Hard to believe this great tasting drink is good for you! This place would be great for a light lunch or all day breakfast. Despite power loss, Derrick's crew kept their cool and still delivered a delicious lunch. Dare I say that they had divine intervention? It means I have to go back to try my first choice, which was baked field mushrooms, stuffed with a vegetable cous cous salad with roasted walnuts and red pepper coulis (cheap at $17). 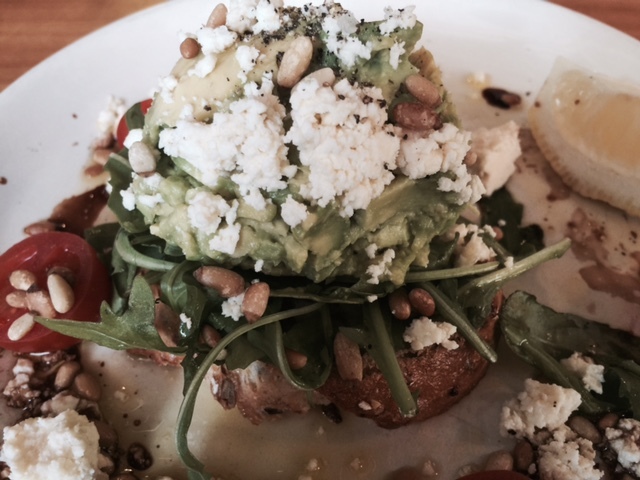 But I always try not to be regretful and the smashed avocado with feta, rocket did not disappoint. This can be served with a poached egg on top. It was just the right sized serving with plenty of avocado and plated up beautifully with pine nuts and pomegranates and perched on seeded sourdough ($18.90). They also have a range of other popular menu items about the same price. I had a chat with Janette, the chef, who showed no sign of distress that she had to manage in the dark with no electricity and no cooling in a hot kitchen on a 35 degree day! She was happily preparing my meal while answering my incessant questions. She said (as a local without bias) that they have the best coffee in Warrandyte. 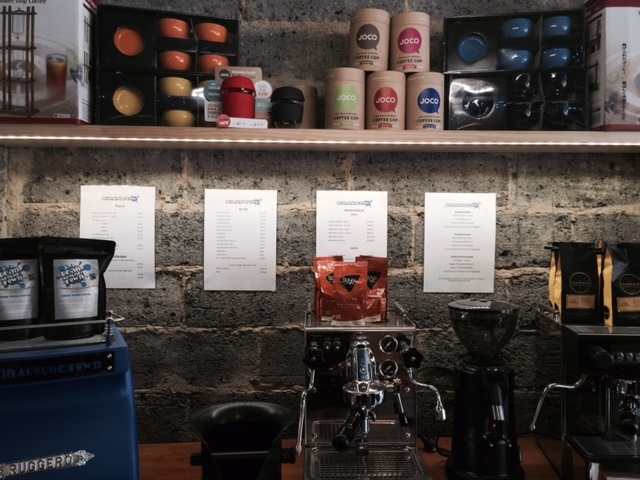 They also sell fair trade coffee and top end coffee machines for those who really want to indluge. I'm not really a stalker but I did ask another young customer why she came to Now And Not Yet as Warrandyte is over endowed with cool cafs. She said it looked great as she passed it. 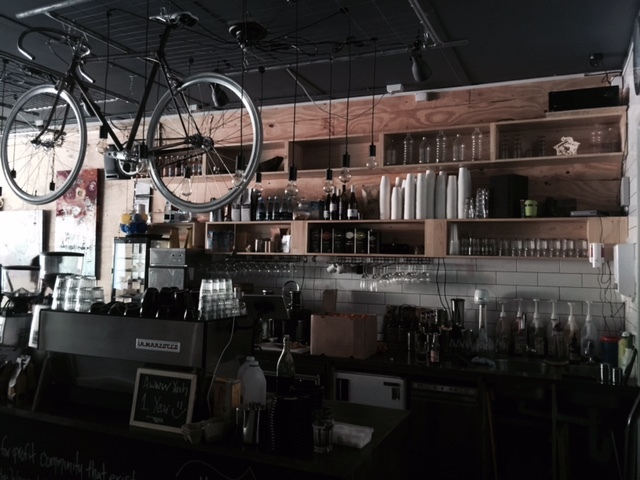 Another local heard our conversation and added, "It's a great café, a really great café!" She was holding the hands of two little girls. I noticed that the clientele was varied. There were a couple of newborns (with their parents and grandparents), couples, young adults and groups of ladies. But wait there's more… Now And Not Yet support local artists and have created a special glassed in art studio in the café. 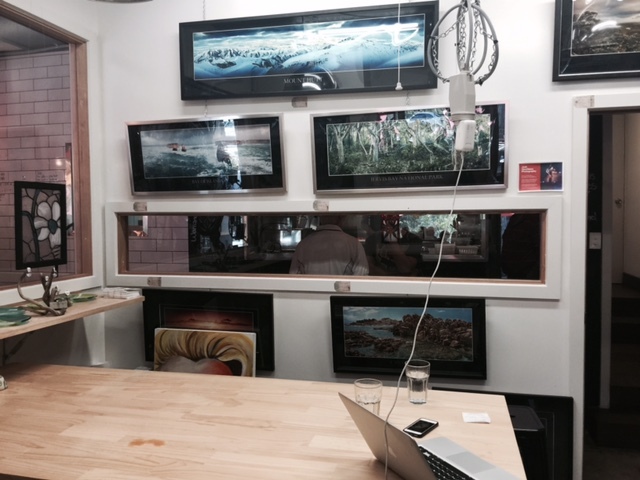 'Create Space' is an artist run collaboration in the heart of the café. This is designed to create community and shared experiences for artists living and working in the area. 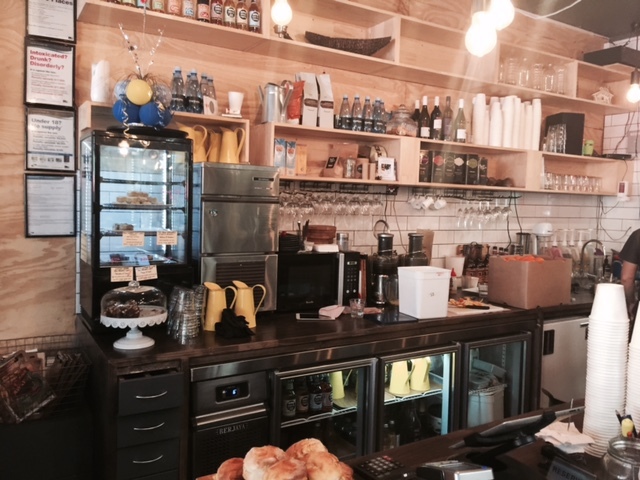 Visitors to the café can meet, watch and interact with the local artists and purchase their products. 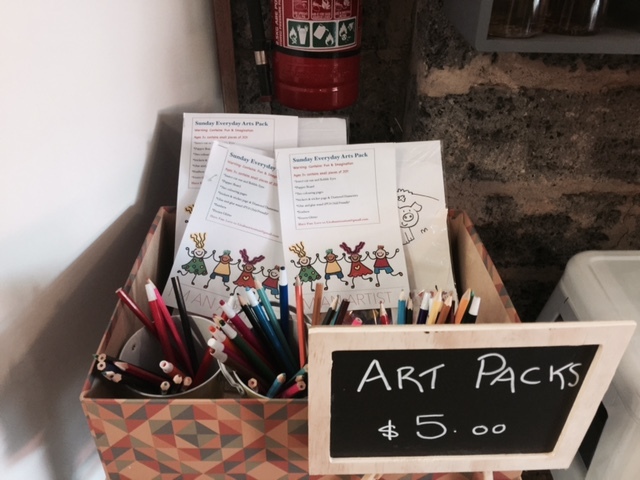 I noticed they also sell Kids Art packs ($5) for little ones who are artistically inspired. Recently they ran arts therapy classes for adults which were a huge success. These were only $60 for 6 classes as they were heavily subsidised. They will be run regularly so look out for the new course dates. And more… They do NOT sell steak knives but they do host special live music events and poetry slam offs at no extra charge. 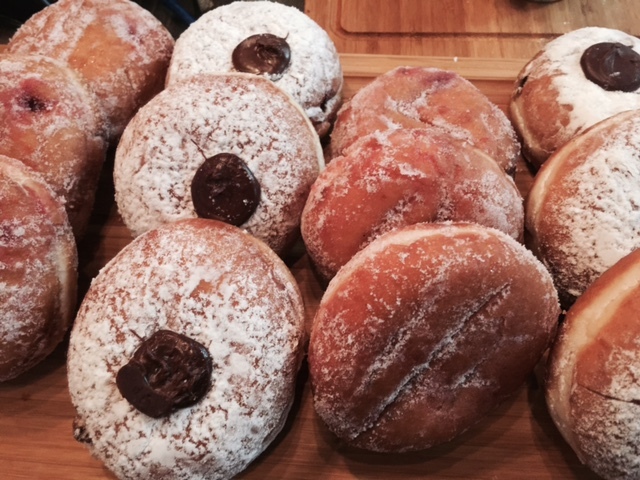 This café is like the pizza with the lot and who can resist one or two of those? It is more than a café; it's a divine meeting place. 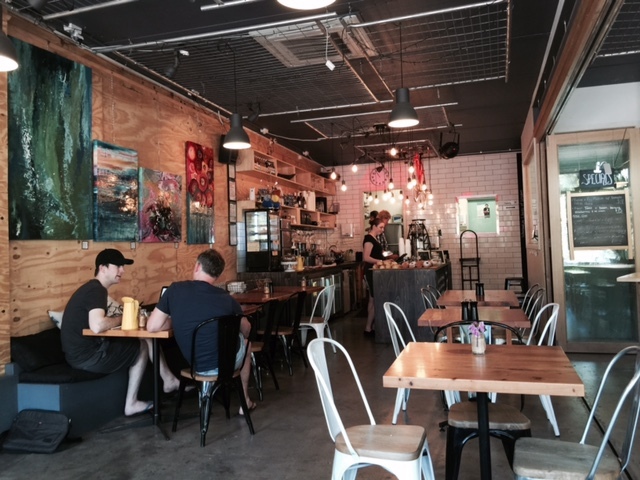 I imagine that Now And Not Yet Café will soon be the favorite gathering place for people of all ages, artists, philanthropists, coffee lovers and diners beyond the locals. I could potentially go on endlessly about this café and it's conception as it is so impressive but I must finish. The styling is awesome. We sat in the front on a couch with cushions where the windows had all been opened. There's also outside seating. I noticed many features in my photos later that I missed the first time around so I absolutely have to go back. I will close with one of the inspirational quotes on the wall – it was calling to me and it's for my friend Les. 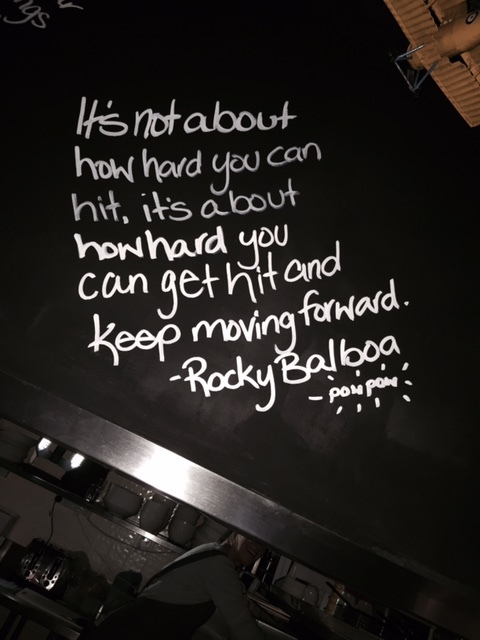 'It's not about how hard you can hit, it's about how hard you can get hit and keep moving forward'. Rocky Balboa. What a terrific place Jeni. It is obviously run by some very passionate and inspired people and that shows.